Find out who will win today? In Today’s Dream11 Fantasy Cricket Prediction of KXIP vs SRH 25th T20 Match IPL 2018 we will cover expected playing 11, pitch report of Rajiv Gandhi International Stadium, Hyderabad, the best team for dream11, what astrology has to say on the toss. We will also cover players recent and past performance, playing condition, dream11 guru prediction, key players, the best choice for captain and vice-captain, weather report of Hyderabad, all the updates and latest news related to SRH vs KXIP, where to watch the live cricket match and details of live streaming. Make sure to read the complete post to get 100% benefit. The details that we provide are absolutely FREE of cost. You don’t have to pay a penny for that. Where Can You Watch the Live Streaming of KXIP vs SRH or Channels to Watch? Who Will Win the 25th Match of IPL 2018 Between KXIP vs SRH and Toss Prediction? What is the best combination of players for Dream11 25th Match? Date: The match will be played on 26th April 2018 (Thursday). 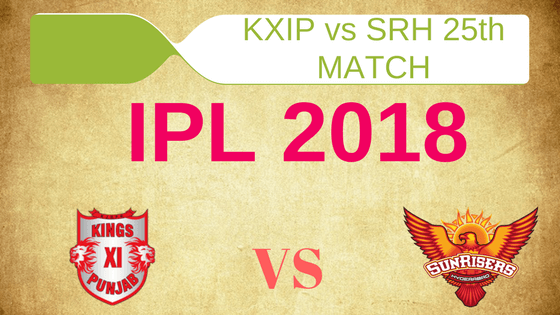 Match: Indian Premier League, SRH vs KXIP, IPL 2018. The pitch of Hyderabad is often two-paced. This pitch will favour the bowlers today. Seamers and spinners both can get some help from the pitch if they bowl in the right area. There is very little help for the batsmen. It will be a good contest between the bat and ball. Today in the morning rain is expected. Before the start of the game, there will be isolated thunderstorms. At the time of the play, the sky will be clear and no rain is expected. The temperature is expected to be 33-Degree Celsius and humidity to be 47% which may go up to 70%. If we look at last five matches SRH has won 4 matches out of 5 matches whereas KXIP has only won one game. In overall encounters, Sunrisers Hyderabad has won eight times and Kings XI Punjab has won three times. In Hyderabad, SRH is head of KXIP as they have won 4 games and KXIP has won only one game. Star Sports has paid a huge amount of INR 16,347.50 Crores to get exclusive rights of IPL 2018 for live coverage for five years starting from 2018 to 2022. Star Sports has all the media rights including TV and all Digital Rights. You can watch the full match of Sunrisers Hyderabad vs Kings XI Punjab on Star Sports. Shikhar Dhawan, Kane Williamson (c), Deepak Hooda, Wriddhiman Saha (wk), Mehdi Hasan, Manish Pandey, Bhuvneshwar Kumar, Chris Jordan, Shakib Al Hasan, Carlos Brathwaite, Yusuf Pathan, Sachin Baby, Mohammad Nabi, Tanmay Agarwal, Rashid Khan, Alex Hales, Bipul Sharma, Basil Thampi, T Natarajan, Siddarth Kaul, Ricky Bhui, Shreevats Goswami, Sandeep Sharma, K Khaleel Ahmed. Aaron Finch, Lokesh Rahul (wk), David Miller, Ravichandran Ashwin (c), Manoj Tiwary, Mayank Agarwal, Ankit Rajpoot, Karun Nair, Mohit Sharma, Yuvraj Singh, Mayank Dagar, Andrew Tye, Manzoor Dar, Barinder Sran, Chris Gayle, Pardeep Sahu, Mujeeb Ur Rahman, Marcus Stoinis, Ben Dwarshuis, Akshdeep Nath, Axar Patel. Both the teams are at the top of the points table and they will love to continue like this. Both the teams have some injuries related issues. Chris Gayle didn’t play the previous game but he is most likely to return and replace Aaron Finch or David Miller. Except for these changes KXIP will go with same playing 11. Aaron Finch/Chris Gayle, Mayank Agarwal, Mujeeb Ur Rahman, Lokesh Rahul (wk), Ravichandran Ashwin (c), Karun Nair, David Miller/Chris Gayle, Yuvraj Singh, Barinder Sran, Andrew Tye, Ankit Rajpoot. SRH may bring some changes in their playing 11 for today’s match. If Bhuvneshwar Kumar is declared fit then he will replace Basil Thampi or Sandeep Sharma. Alex Hales may get a chance in place of Mohd Nabi. Kane Williamson (c), Manish Pandey, Shikhar Dhawan, Wriddhiman Saha (wk), Siddarth Kaul, Yusuf Pathan, Rashid Khan, Deepak Hooda, Bhuvneshwar Kumar/Sandeep Sharma, Basil Thampi, Mohammad Nabi/ Alex Hales. KXIP and SRH are in top four in the points table. Universal Boss smashed SRH bowlers in the previous match they played against each other. Sunrisers Hyderabad has a better record against Kings XI Punjab. Our cricket experts say that KXIP will win today’s match. According to our astrology team, KXIP will win the toss and they will ask SRH to bowl first in today’s match. If Gayle plays, he is the best option to have on your team along with KL Rahul. Make a combination of bowlers with some key players. We have given key players in the post. Conclusion: This is it for Today’s Dream11 Fantasy Cricket Match Prediction of SRH vs KXIP, 25th T20 Match, IPL 2018 which will be played on Thursday 26th April. You can give your valuable feedback in the comment section. Subscribe to our notification of latest updates. GOODBYE!